Fall Armyworm munching on maize. 14 August 2018, Rome/Bangkok - Fall Armyworm could threaten the food security and livelihoods of millions of small-scale farmers in Asia as the invasive crop-eating pest is highly likely to spread further from India, with South East Asia and South China most at risk, FAO warned today. Recently detected in India - the first time it has been found in Asia - the insect has the capacity to fly over long distances (100 km per night) and ravage crops all year round given the region's favourable tropical and sub-tropical climate, which means there are always crops and weeds around that Fall Armyworm can feed on. Fall Armyworm can eat maize and some 80 other crops, including rice, vegetables, groundnuts and cotton. 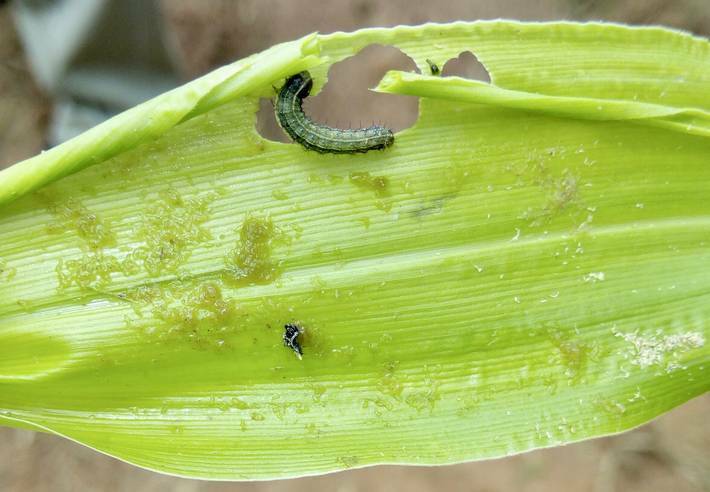 "Fall Armyworm could have a devastating impact on Asia's maize and rice producers - mostly small-scale farmers who depend on their crops for food and to make a living. This is a threat that we cannot ignore," said Kundhavi Kadiresan, FAO Assistant Director-General and Regional Representative for Asia and the Pacific. In Asia, where small-scale farmers cultivate about 80 percent of the region's farmlands, rice and maize are amongst the most produced and consumed cereals. Over 200 million hectares of maize and rice are cultivated annually in Asia. China is the second-largest maize-producing country in the world, and over 90 percent of the world's rice is produced and consumed in the Asia-Pacific region. Native to the Americas, Fall Armyworm has already spread across Africa where it was first detected in early 2016. By early 2018, all but 10 (mostly in the north of the continent) African states and territories have reported infestations and the pest has affected millions of hectares of maize and sorghum. Given FAO's knowledge and coordination role towards a sustainable management of Fall Armyworm in Africa, FAO is offering its expertise to famers and governments in Asia who will quickly face decisions about best ways to manage the pest. "Much of what FAO has already done in sub-Saharan Africa to help farmers and governments better monitor and mitigate Fall Armyworm damage can also be applied in Asia. This includes recommendations on pesticide management, monitoring and early warning, and a practical guide for farmers and government extension workers on how to best manage the pest," said Hans Dreyer, Director of FAO's Plant Production and Protection Division. Maintain technical backstopping and coordination efforts at country, sub-regional, regional and global level in order to continue enabling member countries, farmers' organizations and individual farmers to manage the pest. In Africa, FAO took immediate steps as soon as Fall Armyworm was detected, bringing together experts to share knowledge and experiences on sustainable Fall Armyworm management; developing tools (farmers' manual, mobile apps, web-platform, FAWRisk-Map) to build early warning, monitoring and response mechanisms; and supporting countries to mitigate pest damage, develop action plans and policies, and train extension workers and farmers. To date, more than 30 FAO-supported projects have been rolled out in Africa to fight the pest.